Unless you’ve come off a horse a few times before, it may surprise you to learn that horseback riding has a higher rate of injurythan motorcycle riding. 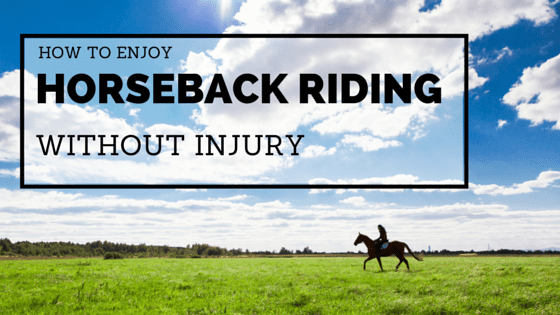 With riding season underway, and with horse riding being quite popular in Leduc, we at the clinic thought it would be good to share some insights on staying injury free. Because riding is a skill that requires such full body engagement, injuries tend to be varied. Nasty falls can result in injury to the back, shoulders and wrists, and can sometimes include more serious injuries such as dislocations, concussions, fractures, soft tissue damage or head injuries. But experienced riders can attest to the fact that riding can take its toll even without falling off. During riding, three key areas take strain as the rider maintains control of the horse but also of their torso, legs and upper body. The up and down motion of rising trots or faster gaits can impact the lower back and lead to increased compression and strain of disc tissue. The pressure from over-loading or direct impacts can lead over time to spinal stenosis (where the spinal nerve roots in the lower back get “pinched”). Symptoms of lower back compression include pain that can sometimes refer down into the buttocks. A good way to avoid aggravating the low back is making sure you have good trunk strength and can maintain a neutral position for your lumbar spine (a slight curve, but not too much of a curve). A skilled rider’s main point of contact with the horse is via the saddle, with their legs, hips and knees. Unfortunately, increased frequency of riding or improper form can strain the knee ligaments and/or hip adductor muscles. The problem with constantly compressing the knees and thighs around the horse is that these muscles can become strained. While the adductor muscles become strong and well developed, the abductor muscles are relatively unconditioned. This results in imbalances in not only riding form, but in the rider’s walking and standing pattern when not on horseback. A good habit for regular riders is to incorporate hip abduction and external rotation exercises into a home exercise program. This strengthening will help to minimize potential imbalances – and knee ligaments stay protected. To further protect the knee, make sure that your foot position in the stirrup is correct and that your boot fits well inside it so that if a fall occurs, you won’t be dragged along. A good starting exercise is the “clam shell”. Here’s how to do it: Lie on your side with knees bent inward at around a 45 degree angle. Keeping the ankles pressed together, open and close the legs to create a clam shell motion and stretch the external hip muscles. Often, minor injuries and strains develop as a result of poor posture and muscle control while riding. A slouch that tucks the tailbone is common, or else hyperextending the lower back can amplify small impacts and exacerbate compression on the entire spine. Mastering a neutral spine and correct posture will make mounted control easier. Core strength exercises are ideal for conditioning a strong base. Good riding practice naturally means hard helmets, correctly fitting riding clothes and gear that is is maintained in good condition for every ride. Proper grooming and handling technique while in the stable will also go a long way in preventing accidents and injuries. If you’re a seasoned rider, a complete novice or have already injured yourself horse-riding, a comprehensive assessment can be invaluable. Most of us are unaware of our core, our posture and the specific areas we may be strained and compressed. An assessment with one of our physiotherapists can provide insight and equip you with tools to help you enjoy riding for years to come.